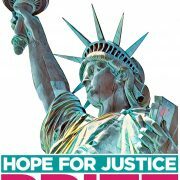 The Arkansas Access to Justice Foundation today announces a writing contest with a $1000 prize to be awarded to the best entry from an Arkansas high school student, and another to the best entry from an Arkansas adult (age 19 or older). 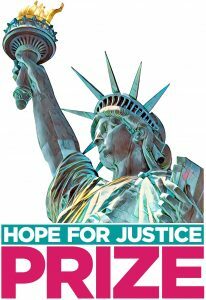 The Hope for Justice Prize will be awarded for original, written works of fiction that illuminate the importance of access to justice in the lives of children. The deadline for submissions is October 1, 2017. For more information, including complete terms and conditions, click here. Caitlin Savage, a devoted pro bono attorney and community volunteer, will be honored with the Equal Justice Distinguished Service Award at the upcoming 2017 Arkansas Bar Annual Meeting in June. The Arkansas Bar Foundation annually issues the award to an individual who shows a commitment to equal justice programs for the poor, including pro bono efforts through legal services programs. Ms. Savage is one of the youngest recipients to have received this award, having just graduated from the University of Arkansas School of Law in 2013. Since becoming an attorney, Ms. Savage has volunteered for Arkansas Access to Justice, Legal Aid of Arkansas, and Center for Arkansas Legal Services in clinics to assist marginalized Arkansans with legal documents necessary to improve employment opportunities, preserve family stability, and obtain identity documents. In 2016, Ms. Savage was appointed as the chair of the Pro Bono Committee for the Arkansas Bar Association’s Young Lawyers’ Section. As chair, Caitlin has worked tirelessly to serve the low-income citizens of Arkansas. She has assisted Legal Aid of Arkansas with its expungement clinic at St. Vincent’s Hospital through its Medical-Legal Partnership. She has also organized three separate Wills for Heroes Estate Planning Clinics across the state which specifically serve police, firefighters, first responders, and veterans. Apart from her pro bono work, Caitlin is passionate about fundraising for local nonprofits. 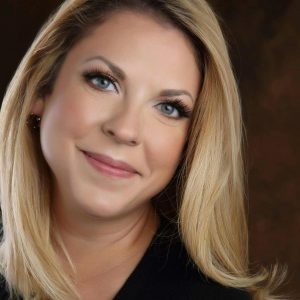 In 2015, she received a grant from the Southern Partners Fund to study “raising resources in the rural South.” In 2016, the Arkansas Association of Fundraising Professionals named her as the Chamberlain Scholar for her devotion to fundraising. Since 2015, Ms. Savage has volunteered her time with Lucie’s Place, the only nonprofit in Arkansas that specifically houses and assists homeless LGBT youth. She now serves as the chair of the Fundraising Advisory Board, where she organizes and supervises several fundraisers throughout the year. Last year, Ms. Savage served as the chair of the Merchants Lounge Committee for the Junior League of Little Rock’s Holiday House fundraiser. This event is the organization’s largest fundraiser, providing the bulk of the funding for their volunteer work throughout the community. Caitlin also volunteered last year on behalf of the Arkansas Bar Association at Hall High School’s Law Day celebration, where she discussed the importance of Miranda rights with students. Ms. Savage is an attorney with Wilson & Associates, PLLC, in Little Rock. 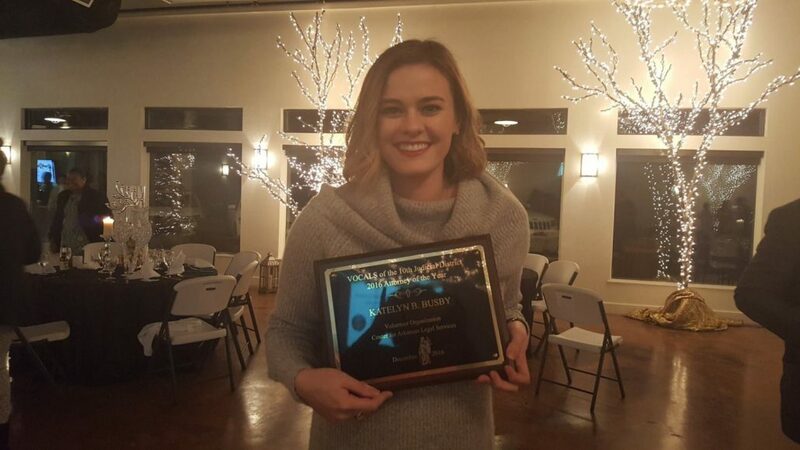 Katelyn Busby, a Monticello attorney practicing at the Hashem Law Firm, was recently honored by the Center for Arkansas Legal Services as their Attorney of the Year for the 10th Judicial District. Each year, the Center selects an attorney practicing in the 10th Judicial District to receive this award. To receive the award, an attorney must participate in VOCALS, a program run by the Center which matches volunteer attorneys in private practice with low-income clients in need of legal assistance. Mrs. Busby was selected for the award based on her dedication to serving those in need and her active participation as a volunteer with the VOCALS program. The Arkanas Access to Justice Commission joins the Center for Arkanas Legal Services in thanking Mrs. Busby for living up to the professional obligation all attorneys have to serve the impoverished, the defenseless, and the oppressed. Jimmy Dill, of Pine Bluff Title Company, was recently named the 2016 Volunteer Attorney of the Year for Jefferson County. The award was presented by the Center for Arkansas Legal Services at the Jefferson County Bar Association’s December meeting. The Center is a non-profit law firm which represents low income individuals with legal problems. To be eligible for the Volunteer Attorney of the Year Award, an attorney must participate in the VOCALS program. This program allows the Center to serve more clients by matching attorneys in private practice willing to donate some of their time with indigent clients. 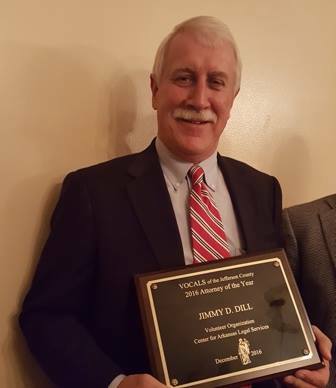 Mr. Dill was selected for his dedication to service and willingness to assist clients through the VOCALS program. The Arkansas Access to Justice Commission congratulates Mr. Dill on receiving this award and encourages all attorneys to show the same committment to giving back to their communties. Former Arkansas Access to Justice Commissioner and Foundation Board Member Nate Coulter was honored at the June 2016 Arkansas Bar Annual Meeting with the Equal Justice Distinguished Service Award. The Arkansas Bar Foundation annually issues the award to an individual in recognition of their commitment to and participation in equal justice programs for the poor, including pro bono efforts, through legal services programs. Over the course of his career, Coulter has played a major role in shaping the access-to-justice movement in Arkansas. In 2000, he convened and invited leaders in the Arkansas bar, bench, law schools, and other stakeholders to speak at the first symposium on the legal needs of low-income Arkansans and access to justice in Arkansas. This event resulted in the creation of an Arkansas Bar Association task force that petitioned the Arkansas Supreme Court for the creation of the Arkansas Access to Justice Commission. After the petition was granted, Coulter served on the Commission for eleven years. During his tenure, he was involved in initiatives to increase funding for civil legal aid and improve access to the civil justice system for all Arkansans. Coulter has also demonstrated his commitment to access to justice through his service to other organizations. He has served as a member of VOCALS since 1987, and on the board of directors of the Arkansas Access to Justice Foundation (formerly Arkansas IOLTA Foundation) board from 2002 to 2016. 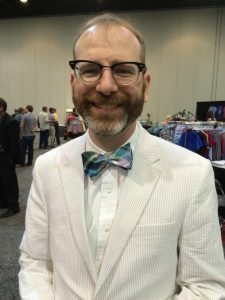 Coulter currently serves at the Director of the Central Arkansas Library System. James D. Gingerich, Director of the Arkansas Administrative Office of the Courts, recently was named recipient of the Kenneth R. Palmer Distinguished Service Award. The presentation was made during the joint meeting of the Conference of Chief Justices and Conference of State Court Administrators (COSCA) during their annual meeting in Omaha, Nebraska. 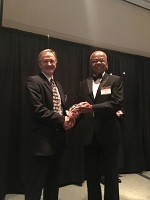 The award is presented every other year to a current or former member of COSCA who has demonstrated extraordinary leadership and excellence in judicial administration. 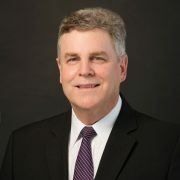 “Gingerich has diligently worked not only to improve the justice system at home, but he has contributed his formidable talents in so many ways to COSCA that it would be simply impossible to list them all,” West Virginia State Court Administrator Steven D. Canterbury said in a letter of nomination. Among his colleagues, Gingerich is considered a “transformative leader,” helping the courts in his state advance in several areas, such as structural and administrative unification, court technology, problem-solving courts, criminal justice sentencing reform, court financing, access to justice, interpreter services, and court security and emergency preparedness. In 2012 he was inducted into the NCSC Warren Burger Society for his volunteer service with the International Programs Division to improve courts in Kosovo and Haiti. Gingerich served as COSCA president in 2006 at which time he also served as vice-chair of the National Center for State Courts Board of Directors. He was appointed Arkansas State Court Administrator in 1988 and in that capacity, he also serves as the secretary/treasurer of the Arkansas Judicial Council. Originally from Stuttgart, Gingerich received degrees from the University of Central Arkansas, the University of Arkansas School of Law and the University of Bristol, England. He and his wife, Janet, now reside in Conway. The Palmer Award was created in 2001 and honors Kenneth Palmer, the former Florida State Court Administrator. At the time of his death, Palmer was one of the longest serving state court administrators in the country. COSCA is comprised of the chief executives of the court systems in each state, the District of Columbia, and the U.S. territories. The conference is committed to strengthening the judicial branch by improving the quality of state courts and increasing the public’s trust and confidence in the justice system. COSCA works closely with the Conference of Chief Justices, CCJ, which is made up of the top judicial official from each state and territory. The two associations promote the interests and effectiveness of state judicial systems by developing policies and educational programs designed to improve court operations. Both COSCA and CCJ act as the primary representative of the state courts before Congress and federal executive agencies. The National Center for State Courts, headquartered in Williamsburg, Va., is a nonprofit court organization dedicated to improving the administration of justice by providing leadership and service to the state courts. NCSC provides executive secretariat work to COSCA. Founded in 1971 by the Conference of Chief Justices and Chief Justice of the United States Warren E. Burger, NCSC provides education, training, technology, management, and research services to the nation’s state courts. 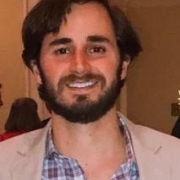 Center for Arkansas Legal Services Managing Attorney Dustin Duke is the 2015 recipient of the Arkansas Bar Foundation‘s Equal Justice Distinguished Service Award, according to the Foundation’s Executive Director Ann Pyle. The award, which was presented at a June 10, 2015 awards banquet, is given each year in recognition of commitment to and participation in equal justice program for the poor, including pro bono efforts through legal services programs. During his 14 years of practice, Duke has served clients through both the Center for Arkansas Legal Services and Legal Aid of Arkansas. In his 11 years with the Center, he has handled more than 3,800 cases, 165 of which were in 2014. Much of his case work has focused on family law and domestic abuse. In 2014, Duke was among a team of legal aid attorneys who succeeded in getting Arkansas’s criminal eviction statute overturned in the state’s most populous county.